A meeting will soon be scheduled before the Shasta County Board of Supervisors to vote on release of funds for a new library building in Burney. If passed this will be good for all of the people in the Intermountain Area and a blessing for Shasta County. 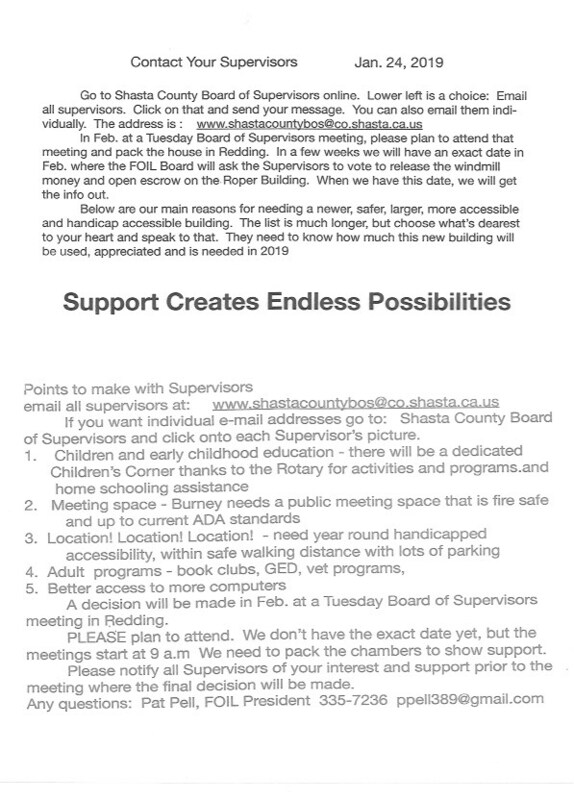 It is very important at this time for people to contact all of the County Supervisors to express your support. Encourage them to review the plan being presented by Friend’s of the Intermountain Library (FOIL) and to vote for release of the Hatchet Ridge Wind Fund money that was set aside for this purpose. Now is the time to act! Here is a flyer from FOIL.